The military has transferred the crocodile at the children’s park in Malé to an unspecified location. According to local media, the crocodile was transferred on Sunday night ahead of work on adjusting its cage. Ahmed “Gahaa” Saeed, then-deputy principal of Majeedhiyya School, caught the young crocodile in 1998. It has since been kept in a cage at the children’s park and grew to about 10 feet in captivity. The caging of the crocodile has attracted a number of protests, including one led by the Billabong International school in 2010, which drew attention to the small cage and bad conditions the animal has been kept in. Laamu Atoll Kalaidhoo islanders have caught a crocodile measuring 10ft in length this morning. According to CNM, the islanders reported seeing the crocodile in shallow waters around the island, with efforts to track the animal failing yesterday despite the efforts of police. Kalaidhoo Council President Moosa Hassan told CNM that islanders were concerned about their safety because of the crocodile and therefore decided to catch it. It was caught using ropes from the jetty area. The council has decided to hand over the animal to Maldives National Defence Force (MNDF) as the council’s budget cannot support feeding it, Haveeru reported. MNDF Spokesman Hussein Ali confirmed to Minivan News that the crocodile is being handed over to MNDF. He was unable to provide any further details. While not native to the Maldives, the discovery of crocodiles in the islands is not uncommon. The most famous of the ‘Kinboo’s’ is housed in the Malé’s children’s park, where it has grown to over 10ft in length since its capture in 2008. However, the crocodile’s cramped living space has prompted repeated accusations of animal cruelty against the MNDF. The World Society for the Protection of Animals (WSPA) has stated that the cage used to house a crocodile in Male’ is “entirely inadequate” for an animal of its size. Locally known as ‘Kinboo’, the crocodile was first captured back in 1998 and was subsequently caged inside a children’s play park for public entertainment. For the last three years, the animal’s poor living conditions have caught the attention of the media, even sparking a campaign from a local school to save the animal, however nothing has yet been done to resolve the issue. WSPA’s Wildlife Veterinary Programmes Manager, Dr Jan Schmidt-Burbach told Minivan News in a statement that the WSPA encouraged local efforts being made to relocate the crocodile to a more suitable facility. “The ideal environment for a wild animal is its wild habitat. Based on the images I have seen, the enclosure [in Male’] is entirely inadequate to meet the needs of a wild crocodile,” Schmidt-Burbach stated. According to captive crocodile husbandry guidelines, the wildlife expert stated that the enclosure needs to have both shaded and sunlit areas and should be a minimum of 36 square-metres. “A majority of the enclosure should be covered in water deep enough for the animal to fully submerge itself. I estimate for this crocodile the pool should be at least one metre deep,” he added. Director General of the Environmental Protection Agency Ibrahim Naeem made similar recommendations to the WSPA in regard to the crocodile, adding that it needs to be kept in an adequate space and is currently living in cage “far too small” for its size. “We believe that the Maldives lacks in technical and financial capacity regarding the animals kept in captivity. Though the conditions are like that, we believe that these animals must be treated with care and killing is not an option in any case,” Naeem said. Last year, Minivan News reported that the crocodile was forced to curl its tail to fit inside its roofed cage. Furthermore, the water within the enclosure barely covered the animal’s stomach – an apparent violation of both international and national laws forbidding animal cruelty. “The 10-foot crocodile in Male’ is living in a far too small cage for it. We believe that the Maldives National Defence Force (MNDF) has conducted enlargements of the cage several times and hope they will continue to do so,” Naeem added. The EPA’s comments follow news that a smaller crocodile had been captured by MNDF last month at Helengeli Resort. MNDF Spokesperson Colonel Abdul Raheem told Minivan News on Thursday (March 14) that there had been “talks” to send the animal abroad, but as of yet nothing had happened. “I don’t think the cage is big enough, but I have no idea if they are going to increase the size of the cage,” Raheem said. In 2010, a group of children from Billabong High School in Male’ attempted to save Kinboo from captivity. Roughly 30 students took part in the ‘mission’ after the crocodile’s living conditions were noticed by the school’s biology teacher, Kate Wilson. Wilson told Minivan News at the time, that she had been “horrified” by the size of the enclosure and enlisted the help from her students to attempt to save the animal. Despite getting in touch with an international agency in Australia and producing a video calling for support, the crocodile still remains in the cage three years later. Last year, Defence Minister Mohamed Nazim claimed that the ministry had planned to send Kinboo abroad to a zoo, replacing the large animal with a “small Kinboo” to keep in the cage instead. According to the minister, a smaller crocodile will be brought to replace the bigger one because a lot of children enjoy watching the creature in its cage. Following the occasional public calls to have the crocodile released, former governments have made similar suggestions about sending the animal overseas, yet none of these plans have transformed into any action. Regarding this matter, Naeem said that because the animal had grown so large, the expense of moving such a big animal to a nearby country is very high. “We had discussions to move the crocodile to a zoo in a neighbouring country, but it was later recommended that since the animal is adjusted to such a condition [of the cage] it minimises its chance of survival in its natural habitat,” Naeem claimed. Defense Minister Mohamed Nazim has confirmed plans to bring a small crocodile from abroad to replace the large crocodile which has been caged at the capital’s children park for almost 15 years. Following its capture in 1998, the then almost four-feet long Kinboo (a local term for the animal) was put in the cage by the government for public entertainment and has remained so ever since. It is now almost 10 feet long and has outgrown the cage which has not been expanded. The water in the cage barely covers its belly while its long powerful tail has to be curled up to fit inside the roofed-cage that is no larger than 15 by 10 feet-an apparent violation of both international and national laws forbidding animal cruelty. Former government’s have also said the same about sending the croc to a zoo abroad following occasional public calls Kinboo’s immediate release. But none of the times, the talks transformed into actions and it is yet unclear what the future holds for the large reptile in captivity. Nazim noted that “two countries have shown interest.” But he stopped short from revealing the names of the interested countries claiming the discussion are underway and ministry hopes the costs of transfer will be covered by the new host country. According to the Minister, a smaller crocodile will be brought to replace the bigger one because a lot of children enjoy watching the the creature in its cage. However, in 2010 a group of children from Billabong High School went onto a mission to save the kinboo from its captivity. Nazim says that environmental NGO’s and animal rights groups will be consulted before taking a decision on replacing the Kinboo. Meanwhile, Minivan News asked why the ministry plans to bring a small crocodile from abroad as recently three small crocodiles had been taken by islanders and police from Maldivian waters and reportedly kept under the watch of Maldives National Defense Force (MNDF). “There are no crocodiles alive on any islands. The only one is in the Children Park,” the Minister claimed. However, after phone calls to the three islands; Shaviyani Komandoo, Thaa Vilufushi and Lhaviyani Naifaru – where the Kinboo’s were captured from, Minivan News found out that two of the crocodiles died while under the watch of MNDF officials and only one still remains alive. According to an islander from Shaviyani Komandoo, following the capture of the two-foot croc from the waters, MNDF officials came to the island and took it under their watch saying it is a dangerous creature. “That crocodile was very beautiful. Some of the islanders even wanted to keep it. But they took it away and last I heard it has died,” he observed. “Some people say it starved to death because the officials didn’t feed it,” he added. Similarly, the six-foot crocodile caught by a Naifaru fishing boat was also taken under MNDF custody and is now dead, according to Naifaru police station. The cause of death is unknown. The surviving crocodile was arrested by the police on Vilufushi island of Thaa atoll. Following the capture of four-foot crocodile, the island council refused to hand over it to the MNDF and provided it shelter in a makeshift water tank on the ground. “With generous aid from some islanders we are keeping the croc well fed. A lot of children go and people go to see it,” said Sulaiman Habeeb, Deputy Director at Vilufushi Council office. He added that the council wants to provide better condition for the crocodile, but they don’t have the budget and resources. “Can you help us do this?” he asked Minivan News. What does the future hold for Kinboo? Meet the famous Nile crocodile, whom we Maldivians call “Kinboo”. The cage pictured here, has been Kinboo’s home since it was caught 15 years ago on February 14. The year, 1998, in which the Kinboo was caught in the Maldivian waters, I had just started school. The report of its capture brought a mixture of shock and delight. Like everyone, both children and adults, I was curious to see a crocodile. After all, the famous predator is an alien species to the Maldive’s eco system. Before that day, the only crocodiles people had seen or heard were from movies and books. For me, it was the Peter Pan cartoon – the “tick tock” crocodile that wanted to eat villain Captain Hook is an all-time favorite of mine. But all the pushing and fighting my way through to the front of the flock surrounding the cage on my visit to see the Kinboo turned out to be a big disappointment. Unlike I had imagined, Kinboo was so small that he was barely visible in the little enclosure built at the children’s park. The water at the enclosure completely covered it. I struggled to get a glimpse and, before I could, was soon pushed back by the eager crowd. From what I overheard, Kinboo did not surface. It was almost over decade later that I got to visit Kinboo for the second time. While living in Addu, I heard stories told by visitors from Male’ about how big the Kinboo had grown. But again, it was nothing like I expected. The sheer size of its growth left me in shock: “It is so big,” I said to my friends in bewilderment. Once barely visible, Kinboo was now almost 10 feet long. The water in the cage barely covered its belly as it lay flat inside. Its long powerful tail was curled up to fit inside the roofed-cage that is no larger than 15 by10 feet. Pieces of papers and candy wrappers were scattered inside, most likely thrown by eager visitors in an attempt to get Kinboo’s attention. Thinking of all those years of captivity disturbed me. After few more looks I went home like other visitors, but the thought of Kinboo’s miserable life never faded away. “Free Kinboo” is of course not a new subject for a story, as some may have already thought whilst reading this article. Yes, I am guilty of bringing you old news. Yes, I also know campaigns were started to “Free Kinboo” years ago. Kinboo even has its own Facebook page, calling for its immediate release, and bloggers have often repeated the lonesome story of Kinboo. Children from Billabong High EPSS International school embarked on a mission to save the Kinboo in 2010 and for a moment it seemed that the Kinboo was finally going to be freed. But the purpose of writing this piece is to remind readers that the mission failed. Kinboo continues to miss out on the world beyond the bars. As we grow up, finish school, start jobs, cast votes and even witnessed three president’s in office – nothing has changed for Kinboo. The life expectancy of a Nile crocodile in captivity can be up to 80 years. Will Kinboo still be in the same cage when we have retired or even passed away? Some may even respond,”There are more important issues like a coup to write about, rather than a dinosaur.” For the latter, I have a request. Put yourself in Kinboo’s shoes. But wait, Kinboo doesn’t have shoes, so I rephrase, put yourself in Kinboo’s cage for a moment. Now imagine that moment was 15 years. What exactly can we do for the Kinboo? Environment Protection Agency (EPA) Director General Ibrahim Naeem believes there are two options. “The first option is to transfer the crocodile to a suitable zoo or wildlife park abroad, where it can be rehabilitated before being freed into the wild. Some efforts were made to rescue the crocodile. But it did not work for some reason,” Ibrahim Naeem explained. During the Billabong School’s mission to save the Kinboo, the school’s former Biology Teacher, Kate Wilson, wrote to an international agency in Australia, which rescues crocodiles that are injured or in bad condition. Unfortunately, she never heard back from the agency. “If we cannot work out a plan to rescue the crocodile,” Naeem said, “it should be killed”. “It is indeed time we do something about the crocodile. We cannot keep it caged forever. Either we should kill it or move it to zoo in a foreign country,” he said. “It is costly to move the crocodile abroad. But the state also bears expenses to feed and keep the crocodile alive in the enclosure. So we have to decide,” he added. The Maldives National Defence Force (MNDF), which oversees the crocodile, also expressed their discontentment at the prospect of keeping the animal caged for life. “We don’t want to keep the crocodile inside the cage. It is there because no decision has been made otherwise. If possible we want to see what options we have,” said MNDF media official Lieutenant Abdullah Mohamed. Friends with whom I shared the idea of a “mercy killing” rejected it instantly, calling it “inhumane”. But should we not take a moment to reconsider what exactly is inhumane. How long are we to keep a living creature behind those bars for mere entertainment? Five more years? Maybe 20? Or until it dies naturally? So I ask, how human are we to cherish our freedom, while the crocodile lies in a cage until death sets it free? A wise man once said, all that is needed for evil to triumph is good men to do nothing. Letting the crocodile suffer in cage is wrong, if not evil. It is time the authorities must decide. Either kill Kinboo or free it. Posted on May 20, 2012 May 21, 2012 Author Hawwa LubnaCategories Politics, Society & CultureTags animal rights, cage, crocodile, Kinboo, maldives, maldives news17 Comments on What does the future hold for Kinboo? A second crocodile found in as many months within Maldivian waters is currently being held by police as they look for a “safe area” to keep the animals, with one expert suggesting that investment in the creatures’ protection could have mutual benefits for local people and the tourism industry. Maldives-based marine biologist Verena Wiesbauer Ali has suggested that although crocodiles may remain a rare presence in the Maldives’ tropical atolls, investment in providing them with a safe enclosure in the country could pay off as a popular attraction for wildlife lovers. The claims were made as police confirmed that a six-foot crocodile was found yesterday near the waters of Naifaru in Lhaviyani Atoll by a fishing boat crew, following on from the apprehension of a four-foot croc by authorities last month in Thaa Atoll. The Lhaviyani Atoll crocodile is thought to be the third such creature of its kind to have been captured in Maldivian waters and the second to be discovered this year alone, with one marine biologist calling the appearance of the animals a “surprising” and rare occurrence within the country. Police Sub-Inspector Ahmed Shiyam said the crocodile was found in local waters at about 2pm yesterday afternoon and was now being kept in the local police station near where it was found in Lhaviyani Atoll, while the police service consulted the environment ministry on the best course of action. Shiyam said that it was currently in talks with environment experts about whether there was a growing chance of crocodiles likely to be found in the country’s waters. “At this moment we are not sure yet [how common they are expected to be],” he added. Although not professing to be a crocodile expert, Verena Wiesbauer Ali, a marine biologist and environmental consultant for local company Water Solutions, told Minivan News that although species such as saltwater crocodiles were common in India, it was “quite surprising” to find them in the atolls of the Maldives. Wiesbauer claimed that she believed it would probably be these saltwater crocodiles that have been most recently discovered in the Maldives and although they are rare, the public should be careful. According to Wiesbauer, the major issue for police holding the animals will now be to find places to keep the crocodiles while also letting them”live in dignity” – options that she claimed are currently limited in the Maldives. The last previous reptilian stranger to be found in the Maldives, a nine foot-long crocodile called ‘Kimboo’, is currently kept in the Kudakudhinge Bageecha (children’s park) in Male’, after it was caught by Maldives National Defence Force cadets in 1998. 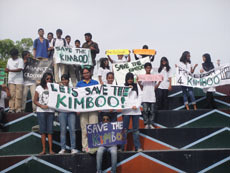 In July 2010, students at Billabong High School in Male’ launched a campaign to ‘Save Kimboo’, due to the small size of its enclosure and poor treatment. Kimboo occasionally makes it into local media and even has his own Facebook page calling for his release, but so far nothing has eventuated. Wiesbauer said that although Kimboo’s cage was kept clean, she believed it was far too small for an animal of its size to now be kept. The marine biologist said by comparison that all three creatures may therefore benefit from potential government or private investment into a special enclosure within the country that could be of interest as an attraction for local people and tourists. Wiesbauer claimed that she is already considering putting together proposals for the government to consider the possible development of an enclosure in an area such as Villingili in North Male’ Atoll where huge areas of government land currently remain unused. As 30 odd students from Billabong High EPSS International school traipsed to Kudakudhinge Bageecha (children’s park) on the southeast side of Male, one might have thought they were on an outing for enjoyment. But these students were on a mission. To save the crocodile, or ‘kimboo’ as they say in Dhivehi. Grade eight student Shiman Shiyam had come to see the kimboo before. It is one of the major attractions at the park along with some birds in cages, and tortoises. “It was sad to see it before also like that, but we never got a chance to do anything about it,” she says. Shiman is busy painting a banner on the grounds of the park along with five other students, calling for the freedom of the kimboo. Here and there pockets of students milling about preparing banners. From time to time, some go to take a peek at the kimboo. The kimboo was caught off an island in Maldives in 1998. When it was first displayed in the little enclosure at the park, you could sometimes barely see it as it was so small the water at the enclosure could completely cover it. But after 12 years in captivity it has grown to nine feet in length, and the water in the enclosure no longer even covers it. It can stretch its body, but the enclosure is too small for it now. Billabong High School’s Biology Teacher, Kate Wilson, was out running with a friend when a detour in the park led them to discovering the crocodile. “We were horrified by the size of the enclosure,” she says. Kate shared the story with her students, who were very keen to help and do what they could to begin the process of finding the crocodile a better home. “We got in touch with an international agency in Australia, which rescues crocodiles that are injured or in bad conditions,” she says. The agency is currently holding discussions to see if it is feasible to rescue the crocodile. To encourage the agency to take action, today the students were making banners and producing a video with messages calling for support. Shiman is confident kimboo will be rescued. Like Shiman, Suha had also come to see the crocodile before and been concerned. “This is all part of marking World Environment Day, albeit belatedly,” says Billabong’s Principal, David Key. Billabong High could not mark the day, as it fell on a holiday. But now, as part of the activities, groups of students are planting 30 trees along the beach front area, and the beach near the tsunami monument. “This is to create awareness among students about what they can do, and how they can help in contributing positively to preserving the environment,” says David. Banners completed, the students gathered on the steps in the park. Each group of students gave the message they wanted to say for the video. Most students mentioned the small enclosure as the prime reason for wanting it to be rescued. “It would be better off in a better home with others of its kind,” was another reason. Sadly, after 12 years in captivity, the kimboo can most likely never be set free. But for the grade 7, 8, 9 and 10 students of Billabong, the fact it might get a better home is reason enough to try. Meanwhile the kimboo lies in its enclosure, its powerful jaws wide open, oblivious to the fact that its future might soon change dramatically for the better.